COMPATIBLE BLADES: According to Amazon\'s policy, we are not allowed to sell blades with the product. But you can easily buy compatible blades like Derby or Astra, double or single edge razor blades from Amazon, your local pharmacy or most large supermarkets. 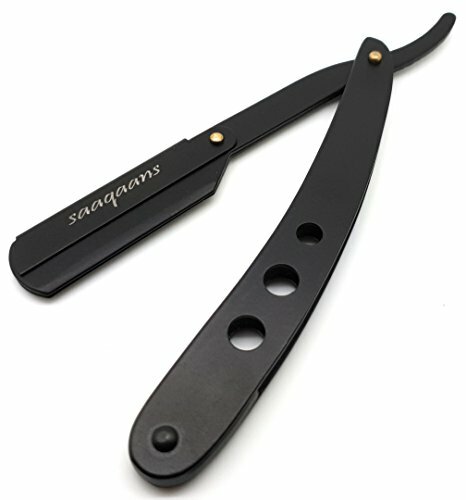 EASY TO INSTALL BLADE: If you are a first time user then please read the below description, or see the product images or you can search for YouTube \'How To Use Saaqaans Shaving Razor\' to watch the video tutorial. We have also included installation guide in the package. WHAT\'S INCLUDED IN THE PACKAGE: You will get this stylish razor with a beautiful pouch, installation guide and a warranty card to extend your standard 30 days guarantee to 6 months. But you must register your product within 30 days of purchase to extend your warranty.